His Shadow League feature story, "Humble Beginnings", was mentioned in the Best American Sports Writing Anthology as among the country's most notable stories of 2014. Follow him on twitter @alidanois He is currently at work on his first book, which is scheduled to be released in September of 2016. He is also serving as a Producer on an upcoming sports documentary for ESPN's 30 For 30 piece. 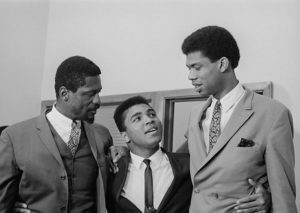 A product of New York City public schools, Ali earned a scholarship for talented inner city minority students to attend Milton Academy, a prestigious boarding school in Massachusetts before attending the Wharton School of Business at the University of Pennsylvania. Sports is much more than the final score, they inform us as to who we are as a society from many distinct vantage points: from commerce, law, entertainment, crime, race, class, inclusiveness and competition. This page will celebrate the unique beauty of the games we love, but will also delve deeper into the greater meaning, telling stories that really matter, about ordinary people accomplishing extraordinary things through the prism of sport, and the various ancillary elements that reach into every inch of the American fabric.